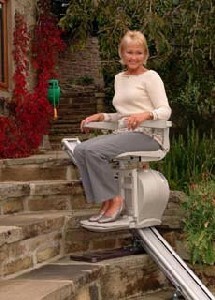 Occasionally it is not possible to use the standard ACORN Superglide stair lift. Perhaps this is because the stairs are exceptionally narrow, or because the users legs will not bend enough to allow them to sit down on the stairlift. ACORN have especially developed the Perch model stair lift to overcome this problem. The perch model is easily operated by the remote control system, or alternatively with the wanderlead control which can be positioned for your maximum comfort and ease of operation. The outdoor stair lift has all the safety and comfort features of the indoor model, but is designed and manufactured specifically for outdoor use.